THE scenic beauty combined with the thriving life of the iconic water village in Brunei enchanted the UK royal couple who are currently on a visit to the Abode of Peace. 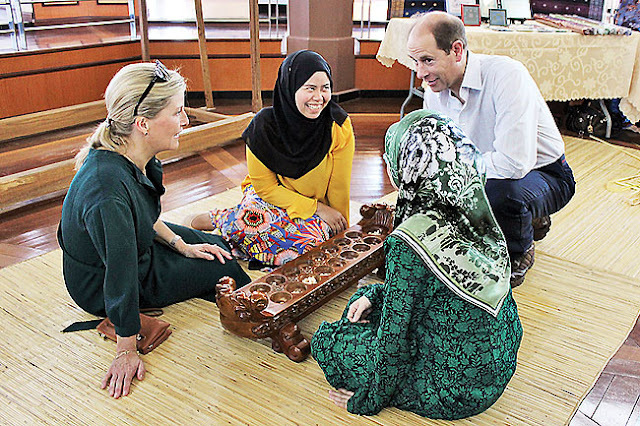 His Royal Highness Prince Edward, the Earl of Wessex, and Her Royal Highness Princess Sophie, the Countess of Wessex, recently paid a visit to Kampong Ayer, one of Brunei’s oldest cultural heritage sites and one of the world’s largest water villages. The Earl and Countess of Wessex were received by Abdul Mutalib bin Pehin Orang Kaya Seri Setia Dato Paduka Haji Mohd Yusof, Permanent Secretary at the Ministry of Home Affairs, at the Bandar Seri Begawan Waterfront Promenade before starting their tour of the water village at the Kampong Ayer Cultural and Tourism Gallery, which was facilitated by Brunei Tourism. The Earl and Countess were shown a short video about the history, culture and way of life of Kampong Ayer before being brought around the gallery where they saw displays showcasing Kampong Ayer since the 10th Century, and watched traditional games being played. 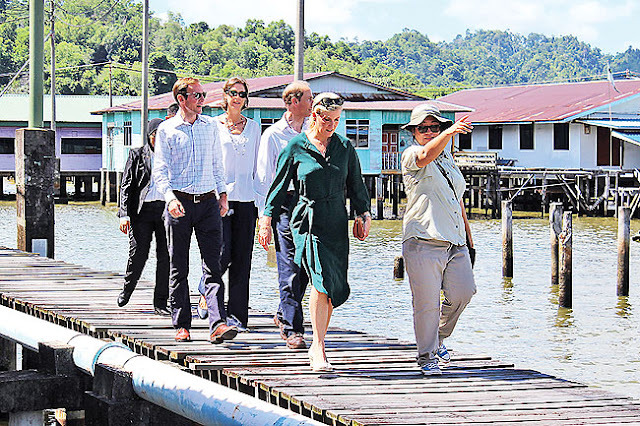 Their Royal Highnesses enjoyed the panoramic view of Kampong Ayer and Bandar Seri Begawan from the observation tower, and watched various attractions including Brunei’s new iconic landmark, the Sungai Kebun Bridge. Their Royal Highnesses then proceeded back into the gallery where they were presented with a painting of them when they last visited Brunei in 2000 by Deputy Permanent Secretary (Tourism) at the Ministry of Primary Resources and Tourism Wardi bin Haji Mohammad Ali. Their Royal Highnesses took a leisurely 30-minute stroll through Kampong Peramu with local tour guide, Dayangku Kemariah binti Pengiran Haji Duraman, where they saw traditional water village life and houses. The Earl and Countess observed prawn crackers being made using traditional methods, and sampled a few, before getting on a boat to Kampong Tamoi Ujong where they were greeted by Penghulu of Mukim Tamoi Pengarah Haji Mokti bin Mohd Salleh and villagers who live in the area. 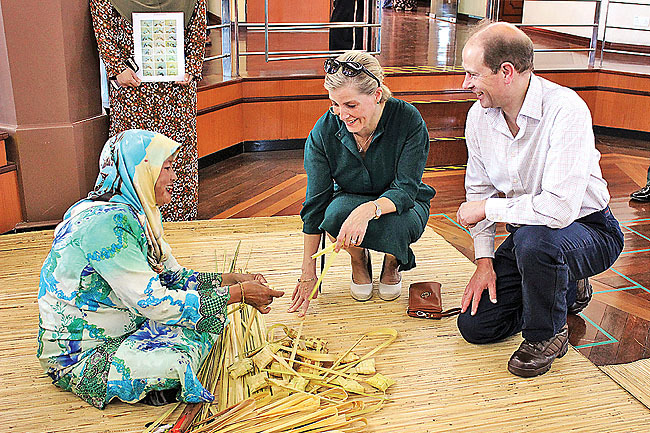 Their Royal Highnesses watched a number of traditional local delicacies being made such as penyaram, belitong and kueh jala; and had the opportunity to make and taste the food themselves. On their return to the Bandar Seri Begawan Waterfront Promenade, the Earl and Countess were presented with a souvenir by Abdul Mutalib. 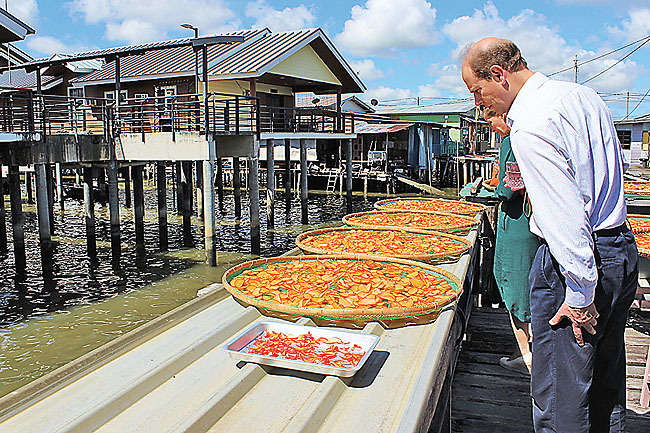 During their time in Kampong Ayer, the Earl and Countess learnt about traditional Bruneian life and culture, and met a number of water village residents. They undertook this trip during the course of their visit to Brunei as representatives of Her Majesty the Queen of the United Kingdom at His Majesty Sultan Haji Hassanal Bolkiah Mu’izzaddin Waddaulah ibni Al-Marhum Sultan Haji Omar ‘Ali Saifuddien Sa’adul Khairi Waddien, Sultan and Yang Di-Pertuan of Brunei Darussalam’s Accession to the Throne Golden Jubilee Celebration.